NOTES FROM THE WINEMAKER: Made from the best and carefully selected grapes on the farm, this is our flagship red wine. The 2015 vintage shows lovely blackcurrent, cherry, mulberry and pepper spice aromas on the nose with a nuttiness from the barrel maturation. The structure of this wine is medium to full bodied, with the Cinsaut providing an elegantly fresh and zippy palate, finishing dry. The Cabernet Sauvignon component of this blend was in new oak, but the other varieties were in 3rd and 4th fill barrels - all 300L French oak and for a period of 20 months. After bottling the wine spends another 6 months in the bottle before being released onto the market. In the Carl Everson Range we aim for complexity, balance and elegance. So, we don't want to overpower the wine drinker with too much oak extraction and rather let the fruit be captain of the ship. THE VINEYARD: Situated next to the Slanghoek River, this vineyard was planted in 1998. The alluvial soil, rich in minerals produces grapes that are in balance and shows great complexity. 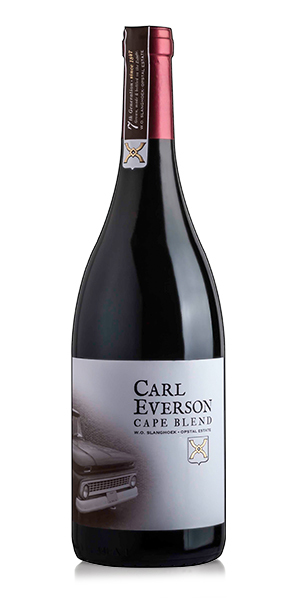 Notify me when Carl Everson Cape Blend 2016 X 6 is available.